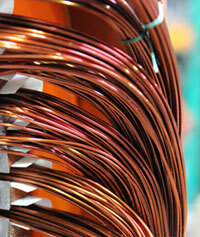 The wire coil transmits current and is mounted on an axle that spins at high speeds. Two parallel wires will generally carry current in opposite directions, bringing it into and away from the motor’s magnetic field. When placed between the poles of a motor’s two permanent magnets and connected to a power source, the wire and its current create another magnetic field that attracts and repels the fields around it. Within electrical motors, the two wires will move in opposite directions. In order to ensure continuous motion, motors apply an alternating current (AC) or a commutator that changes the current’s direction. For the latter case, the wire coil is attached to each half of the commutator so that the electric current can feed power to it through the loose connection of brushes and so rotate the coil continually in the same direction.